Having the best gaming keyboard is important, you need to be able to play a game well. Response time, size, feel, all factor in to how you play your game with your mouse and your keyboard. I used to not play with anything special, just a typical work keyboard. That was a mistake. It is very important to find something of quality, and sometimes we don’t care about the price. I personally don’t like spending money, I’m actually very stingy (that’s why I was playing with an Apple keyboard), but in reality, you need something that will work well with what you’re doing. Check out our research below to help you find the best gaming keyboard under $50: Also, check out the best gaming monitor under $200. If you are a get to the point kind of person, the best gaming keyboard under $50 is the TeckNet Heavy Duty Backlit Gaming Keyboard. If you aren’t, feel free to read on and find out some more about these keyboards. 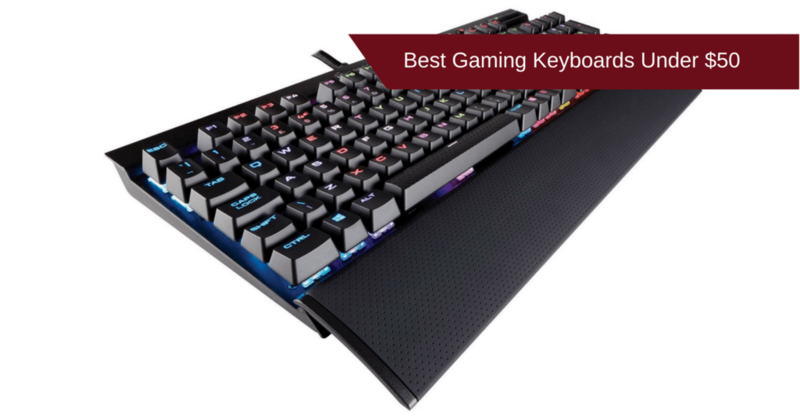 What Makes The Best Gaming Keyboard? Size is just as important with a keyboard as it is with a monitor. Some keyboards have more keys that are placed on the right side of the keyboard. These are typically considered gaming keyboards. If space does not allow you to have this, there are some keyboards that don’t have that extension, though they are not typically optimized for gaming. The reason that space is important kind of ties into comfort. You need enough room on the desk so that you aren’t holding your arms up (unless you like that). To hold my arms so that my elbows are at a 90 degree angle for 2-3 hours kills me, so I want to have enough space. A gaming keyboard typically has 109 keys, while the keyboard without that extension has 78 keys. Durability is another important one. You want something sturdy so that it will hold up for a really long time. There are a couple different ways that people game and you want something that can withstand all of them. The first is the calm gamer, they just simply wear out the keys from pressing them so much, but they don’t slam it. The second is the person who presses down really hard on the keys (not necessarily raging). The problem here is that you can break the internal pieces of keys easily. The third is the raging person, for this you just need an overall hefty keyboard. You want something that can withstand all of the slams, bangs, and throws you give it. In addition to this, you want it to withstand all of a gamers shenanigans, but for a really long period of time. While this does partially go back to size, there is more to be said. You want something where the keys are shaped in a comfortable way. This might seem fairly picky, and I will admit, it might be, but I think it has some importance. The bottom line is, there are different shaped keys, look at an Apple keyboard for example. it has flat, shallow keys, and you might like that. Then you look and a stereo-typically gaming keyboard, it has indented, deep keys. You need to choose whatever fits your style. This is going to get a little technical, so bear with me. There are two different ways a keyboard could go: mechanical, or the other way (kind of broad, but just wait). The other way is fairly simple, it means it is not a personalized. There are different types of mechanical switches (I will explain) and each keyboard differs between three types, linear, clicks, and tactile. Anything other than a mechanical keyboard, most likely has a dome-switch, much simpler and more generic switch. • Linear: A smooth quiet and consistent stroke.• Tactile: Contains a small bump near the actuation point depending on switch.• Clicky: The loudest of the three with a sharp click near the actuation point. Each one of these switches have different strengths and weaknesses for any given situation. While linear switches are great if you want a silent mechanical keyboard, they are slightly less effective for typing. With clicky and tactile switches, you can confirm your keypress is made by the feedback. Each one will give you a different feel. If you are simply looking for a new gaming keyboard, I would recommend linear, but feel free to test out any of the three. This is a very interesting keyboard. I say that because it feels and plays exactly like a tactile keyboard and it sounds as quiet as a linear keyboard, but it isn’t. It isn’t a true mechanical keyboard, but it is meant to feel exactly like one (and it does). As you can tell by the image, it is a 109 key keyboard with a strengthened space key for anyone who spams jump. In addition to this, it is splash proof, meaning it should be able to withstand most spills, and it is kind of durable. It is compatible with Windows 10, Windows 8, Windows 7, Windows Vista, or Windows XP, Mac OS. I would recommend this keyboard to players who can keep their calm. I think that this is a very good keyboard, especially for the price, but it is fairly fragile. If you slam the keyboard or throw it, chances are a good amount of the keycaps will fall off. If you are prone to spills around your devices, this might be a good keyboard because of the splash proof feature. Finally, if you are someone like me who either hits the space key extremely hard, or constantly spams it, this would also be a good keyboard because of the strengthened space key. This 104 key keyboard is slightly more durable than the last. It has a better spill-proof “technology,” meaning 5 drain holes on the bottom of the keyboard. It basically means that the water will run out the bottom of the keyboard without damaging anything. It also has a comfortable palm rest on below the arrows and the space key. The rest is supposed to reduce wrist fatigue while playing. Once again it is not a mechanical keyboard, I think that it is still a great keyboard though. While it does not cater to specific needs like a mechanical, it provides great comfort, which is very important to me. I think this is a pretty solid keyboard. It is extremely spill-proof and hard to damage the keys with spills. That being said, it is easy to scratch. If you are not used to a deep keyboard, it might take some getting used to, but it might be worth it. Even if you are someone who slams their keyboard, it should hold up (for a while), as long as you don’t mind a few dings and scratches. Overall, this will work well for a moderate gamers who sometimes lose their cool. The Hcman Gaming Keyboard is the only true mechanical keyboard on this list. It has Cherry MX Blue switches, meaning it gives off a click when you press it. It also has a very fast response time and gives you conformation that the button works with the click. It is only an 87 key keyboard, but it makes up for it with its fast response time. This does only suit a select group of people, people who like the noise, but the other keyboard are just like tactile and linear, so I felt I needed to be inclusive and find a great clicky keyboard. I would recommend this to anyone who is okay with the click every time they press the key. I personally like the sound, but even if you don’t, it might be worth trying (if you are serious about gaming) because of the fast response time. Also, anyone with limited space should try this keyboard, because it is significantly smaller than all of the other ones on the list. This keyboard has the most keys on our list with 119. The reason for this is it has all of your basic keys, then it has 9 shortcut keys that allow you to open various things directly from your keyboards. This is probably the strongest on our list, all of its keys are re-enforced. This means it can probably handle most of the stuff that you throw its way. This is also the most customizable (the backlit colors), there are 7 different colors and 11 different settings of brightness. In addition to this, it feels like a mechanical keyboard (a very tactile feel) but it isn’t. On top of that, this thing is only $22! Honestly, I don’t know how you could compete with this keyboard. I think that it is the best gaming keyboard under $50. I would recommend this to anyone because it has features to suit almost anyone, but I would especially recommend it to anyone who constantly loses there cool. This keyboard could withstand the majority of the slams you give it, maybe getting a few scratches along the way. It also might be able to take a few glides off the table, and possibly (emphasize that word) a throw. If you threw it, it probably wouldn’t fry it, but something might pop off. I really do love this keyboard, perfect for anyone who rages and also for anyone who keeps their cool. As I mentioned above, I think that the TeckNet Heavy Duty Backlit Gaming Keyboard is the best gaming keyboard under $50. For the price, I think it might be one of the best gaming keyboards out there. It has a heavy, solid feel that gives you a sense of stability. I think you just can’t find that it expensive keyboard, especially the light weight ones. While it isn’t mechanical, it has a very tactile feel and a fast response time.